Emily Parsons-Lord, Then Let Us Run (The Sky is Falling) , installation view, Vitalstatistix, Port Adelaide, for Climate Century, 2018. Photo by Sam Roberts. 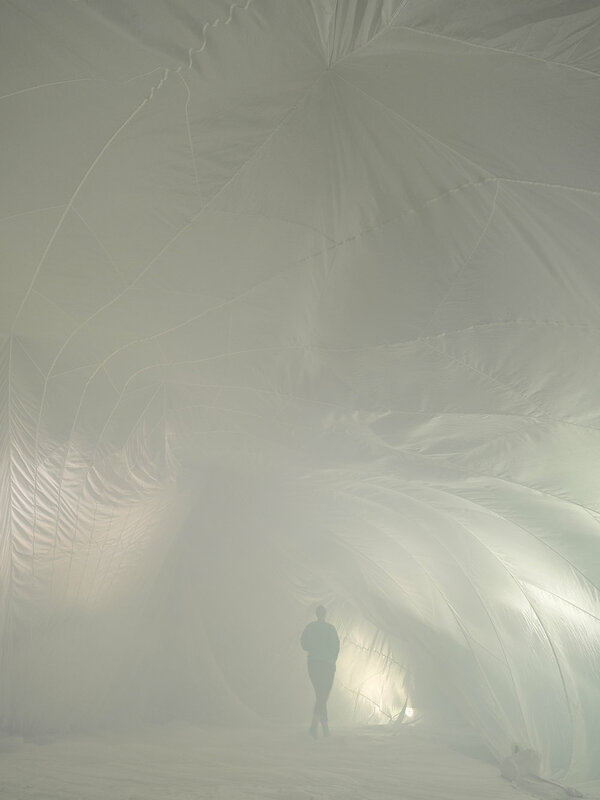 Then Let Us Run (The Sky is Falling) by Emily Parsons-Lord is a billowing immersive balloon made from an ex-US army parachute and filled with artificial smoke. The inflatable structure sits asymmetrically in the Vitalstatistix Waterside Workers Hall and the parachute is lit by spotlights tuned to the colour temperature mimicking how our sky will look if climate-engineering is used to curb global warming and subsequently erasing blue from our sky. From the inside a washed out, hazy brightness fills the space. From the outside the parachute almost appears to be breathing; a lopsided beast slowly rising and falling, the sound of the air pumps humming a constant drone. In the early evening, sunlight streams through the high windows and casts long rectangular shafts of light through the diffusing haze to the opposite side of the hall, bringing attention back to the real sun. This work explores what a future looks like where we have changed our world for good and, amongst many other ideas, asks what is most important: the blue sky or a cooler planet? Contemporary art that explores climate change and conservation can generally be divided into two contrasting frameworks. The first is a more classical preservation or conservation lens that calls for a return to the past, or protecting what has always been. The second view, sometimes nihilistic and maybe best described as a utilitarian environmentalism, is more exploratory and asks, what kind of world do we want to make if we accept that humans have already damaged or changed the planet beyond return? Then Let Us Run (The Sky is Falling) falls into the latter camp. It is worth mentioning that these two approaches to exploring climate are means to the same end. Both approaches provoke thought, discussion and action about the changing climate. This first approach is often didactic in its approach and calls for preservation and returning to a 'natural' or pre-anthropocene state. National Parks and reserves are an embodiment of this view, a slice of wild nature, the preservation of a pristine environment that at least in Australia in fact never was: for at least 60,000 years First Nations peoples had managed and extensively changed the Australian landscape for agriculture, aesthetic purposes, ease of hunting and to mitigate bushfire threat. The current environmental or geological era is referred to by many in various critical studies as the anthropocene, in which humans are the major geological force shaping the planet. We see this in major deforestation, that giant rubbish continent in the Pacific ocean, over-utilising or diverting watercourses and, critically for some as a marker of the world being forever changed by humans, the creation of radioactive elements through nuclear technologies that had never before existed anywhere on earth or in the known universe. Humans have always changed the planet - we transported cereal grains out of the Fertile Crescent in the Middle East to the rest of the world, apples from modern-day Kazakhstan east to China and west across Europe to the United Kingdom. We probably wiped out megafauna in Australia, moas in New Zealand and woolly mammoths wherever they were. The rate of change enacted on the environment by an exponentially growing human population has also increased exponentially. Cities, tourism, internet and people require resources, and as our population has grown so too has our use of space and the resources that make our world turn. The difference between then and now, pre and post-anthropocene, is a matter of the scale of change. Latai Taumoepeau, War Dance of the Final Frontier, performance as part of Climate Century, 2018. Photo by Jennifer Greer Holmes. Courtesy Vitalstatistix. Another work from Climate Century prompted my thinking into this idea from the perspective of contemporary art. Latai Taumoepeau's War Dance of the Final Frontier at Hart’s Mill Packing Shed, a beautiful and powerful hybrid performance/video-animation, in which Taumoepeau, in self-made body armour that appears to be coral reef, embodies an underwater guardian and enacts a war dance to a deep-sea mining beast. Textural, immersive electronic music by Lonelyspeck adds to the impact of mourning for and calling to action on coral reef destruction. War Dance of the Final Frontier, while speculative and technically existing in a fantastic world, falls more into the traditional frame of preservation/conservation. Prior to Climate Century I had been thinking about this idea from the perspective of my scientific background, and environmental policy more broadly. The question I had been trying to answer - and I still have not - is: are we better off if we take as fact that we can't restore the planet to a pre-anthropocene state and focus instead on what is most important for us to save? Who or what gets to stay on the life raft? This utilitarian environmentalism—choosing to save what is most important—is already enacted around the world. Governments and NGOs throw money at certain popular causes at the expense of others, funding is allocated to saving sections of the Amazon but not to preparing Bangladesh from the rising sea level. This kind of utilitarian environmentalism in contemporary art is both hopeful and defeated, at once questioning and accepting a world changed beyond repair. Though not necessarily a better approach to addressing social and environmental issues, it offers another perspective we can use to examine how we want to live. Lucien Alperstein is a scientist working across microbiology, anthropology and science and technology studies in Adelaide, South Australia.